I don’t know about anybody else but every time I visit the salon for my nails doing I always seem to get a kind lecture on looking after my nails. The therapist tells me to use rubber gloves when washing up or gardening (which I never do) and to use a nail oil regularly but I’ve always wondered why it’s so important and how it keeps your nails healthy. So with a bit of investigation I’ve figured it out. What is a nail oil? A nail oil usually comes in the form of a bottle with a brush, similar to a nail polish. The oil inside is designed to protect the skin, nails and to maintain healthy cuticles. The majority of nail/cuticle oils are made from the ingredients Vitamin E, some form of seed oil and sometimes evening primrose oil. Everybody should use a nail oil, whether the person has bare nails or they’re wearing some form of artificial enhancement (Shellac, Gelish or Acrylic) It’s crucial you use a nail oil if you’re going to wear some form of artificial enhancement, especially acrylic nails, to stop the enhancement from drying out, cracking and chipping. Health and shine – An oil keeps nails looking their healthiest at all times even when used on natural nails. Moisture – The ingredients within the oil brings moisture to the nails which you can loose from wearing products such as nail polish or Shellac and can also help moisturise the cuticles and surrounding skin. When the cuticles are nourished, when you visit the salon, the therapist will be able to push the dead cuticle right back and therefore reveal more nail bed giving the look of longer nails. Removing ridges – If you follow your aftercare advice and use your nail oil twice/three times daily the oil will begin to provide the nail with a lot of moisture. Therefore ridges become less visible. Ridges are the horizontal or verticle lines within the nails. Sometimes ridges are caused from medication or over filling of the nails in the past so unfortunately ridges cannot always be removed. Chipping, flaking and splitting – Another advantage to using a nail oil is that it brings strength as well as flexibility to the nails. An oil is perfect for someone with weak nails as it will strengthen them. Even if you have extremely strong nails you should still use a nail oil, this is because sometimes the nails can be so strong that as soon as you knock them they split or chip. The flexibility the oil provides gives the nails more endurance against everyday jobs. Although the flexibility of the nails cannot be seen the oil will definitely help prevent chipping or splitting. Flaking happens when the natural oils in the nails evaporate through everyday jobs (washing up or having the central heating on) so the oil replaces these lost natural oils therefore stopping the nails flaking. 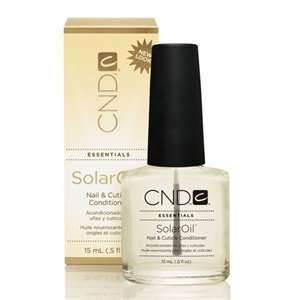 My favourite nail oil I swear by is CND’s Solar Oil. This oil contains all the correct ingredients which put together gives you fabulous looking and feeling nails. Below are the key ingredients the oil contains and why they are so important to give you healthier nails. Jojoba seed oil (simmondsia Chinensis) – This natural oil penetrates into the natural nail to moisturise and condition the nail from below. It also acts like a ‘carrier’ for the other ingredients to increase the penetration to the nail. Jojoba (pronounced ja-ho-ba) oil is also a small enough molecule to pass through the nail bed. Sweet almond oil – This key ingredient softens and moisture the nails, cuticles and surrounding skin. Apply the nail oil with the brush most commonly included with the bottle. Paint generously around the cuticle area and then use your fingers to massage into the entire nail, cuticle and surrounding skin. By massaging the oil in it will also increase the circulation to the fingers and nails therefore encouraging growth. Please bare in mind how imporant it is to use a nail oil yourself as well as recommend it to every single client. I would highly recommend Solar Oil to retail as your clients will see a vast improvement in there nails.